Eco-friendly, user-friendly and innovative, Airwheel electric scooter takes off. Abstract: It is two years since Airwheel was established in the year of 2013. From its establishment on, it has been persistently sticking to its principles: eco-friendly feature, perfect design and consistent innovation. It is two years since Airwheel was established in the year of 2013. From its establishment on, it has been persistently sticking to its principles: eco-friendly feature, perfect design and consistent innovation. These ever-lasting principles guided Airwheel in its every phase of development. In 2013, the electric unicycle X3 came out as the first model launched by Airwheel. Airwheel based X3 on the principles of eco-friendly feature, perfect design and consistent innovation. Although X3 was the attempt to put these principles into practice. Finally, this bold endeavour turned to be rather successful. Up to now, Airwheel still take pride in this endeavour. 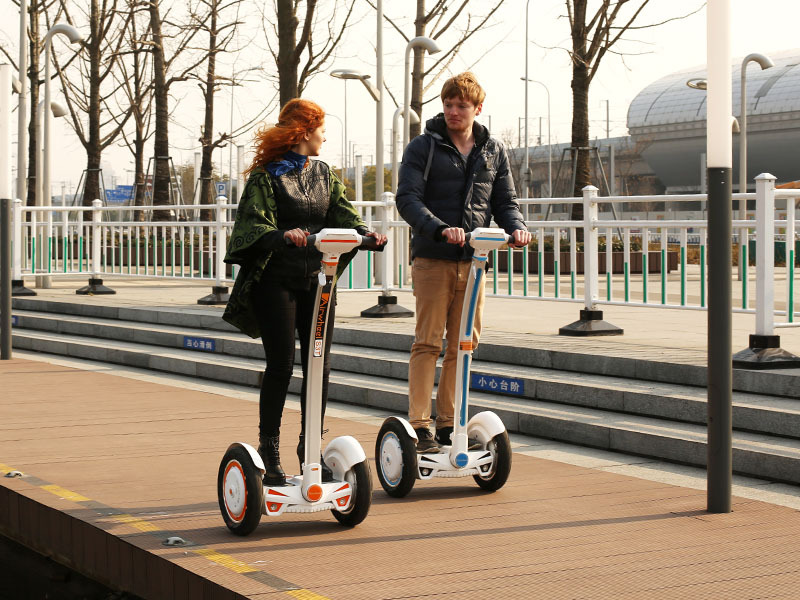 The surging popularity of Airwheel scooters worldwide owes largely to their competitive characteristics. The primary characteristic is safety. The self-balancing mechanism and gyroscope system ensure the balance in riding. In addition, the built-in alert system serves to prevent riders from falling over. The eco-friendly feature is also one of the main draws. The introduction of the lithium battery core eliminates emissions, catering to the current low-carbon trend. In eyes of youngsters, the exquisite exterior design also plays an indispensable role. The streamlined and sleek contour has been mesmerising those tastemakers. Up to now, Airwheel has released various lines of intelligent scooters. In its portfolio, the latest model, intelligent self-balancing scooter S3 combines the most powerful performance of the former models with the most amazing design. Thus, S3 can be termed as the climax of Airwheel’s technology and design. Q-series, for example, Q1, Q3 and Q6, acts as an upgraded version of X-series. This tweak in structure is minute, but it is regarded as a sheer ground-breaking creation. Another character of S3 is Worthing noting. The tightly sealed technology is embedded in S3. Hence, riders are free from the concern about short circuit while steering S3 in a rainy day. This water resistant feature is also one of advantages setting S3 apart from other models.